Bookends: Twelve Houses by Olga Soaje ~ Review!! Twelve Houses by Olga Soaje ~ Review!! 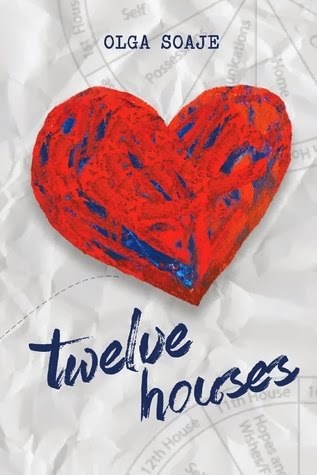 Twelve Houses by Olga Soaje is a remarkable novel of life and death and love and loss so intricately and wonderfully woven together. The first chapter of this book is so incredibly sad. Amelia has lost her husband, Nathan, the love of her life. She doesn't know how she can possibly go on without him and furthermore, she doesn't want to. In Twelve Houses we follow Amelia on her journey to find a balance, a routine, a reason in her new life. She has to learn to live life without Nathan and to forgive him for making her do so. But more importantly she has to learn to forgive herself for wanting to. I loved this book. It's so easy to find yourself connecting to the characters and story. I've never experienced a loss like Amelia's but I have experienced great love and I felt so many emotions with her every step of the way. This is a novel for the masses. There is something in it for everyone to relate to and that's part of what makes it so great. Do you have or have you had a great love? So did Amelia. Have you experienced a heart breaking, life changing loss? So did Amelia. Do you struggle to connect with your kids? Live with regrets? Have amazing friends? So does Amelia. Twelve Houses was a beautifully written, moving novel full of friendships and choices and love and life. This author has an amazing talent for storytelling. I will recommend this book to everyone I know and I look forward to reading more by Olga Soaje. In my novel Twelve Houses, I tell the story of a widow who discovers that her life story is far from over. Amelia is a brave woman who struggles to find her true place in the world and at the same time to create a life that holds spiritual meaning and purpose. Though my first book, Borrowing My Mother’s Saints, was a comedy set in New York, I think both books describe a similar spiritual journey. I always consider the spiritual aspects of a character’s story as I write.